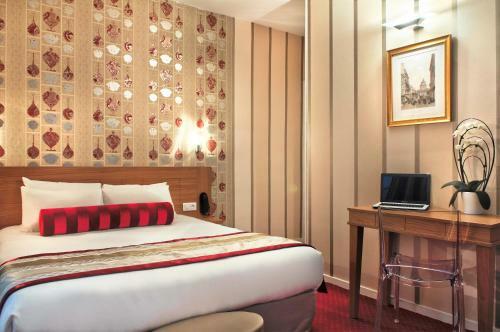 Hotel Romance Malsherbes is set within an elegant 19th-century building, within walking distance of Park Monceau and 2 km from the Champs Elysées and Montmartre. Each floor features an individual, pastel colour scheme. The spacious guest rooms are decorated with antique-style furnishings and include flat-screen LCD TV with satellite channels. All have a kitchenette with microwave and fridge, and some offer free Wi-Fi access. A Nespresso coffee machine and tea making facilities are available at the reception. A daily continental buffet breakfast including freshly-squeezed orange juice, pastries and cold cuts is served every morning in the vaulted cellar. In addition to a 24-hour front desk, Hotel Malesherbes also provides an airport shuttle service. Malsherbes Metro station is 800 metres from the hotel, providing access to the capital’s many sites, such as the Sacré Coeur Basilica and the Eiffel Tower. Free Wi-Fi access and an LCD TV with satellite channels feature in this room. Rate: € 70.10 ... € 117.00; select dates below to get current rates. This larger room has free Wi-Fi access and an LCD TV with satellite channels. Extras include slippers. You can use the kitchenette free of charge. Rate: € 84.00 ... € 132.00; select dates below to get current rates. Rate: € 116.10 ... € 198.00; select dates below to get current rates. This more spacious room features free Wi-Fi access and a flat-screen TV with satellite channels. It includes slippers, a Nespresso coffee machine and a box of chocolates or a fruit basket. Rate: € 97.00 ... € 147.00; select dates below to get current rates. Rate: € 156.60 ... € 211.00; select dates below to get current rates.